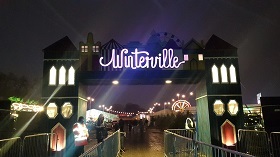 As Christmas is only around the corner tourists will be flocking to the great winter wonderland for some festive fun, however this year there is an alternative festive experience set within Victoria Park called Winterville opening from26th November to 23rd December. Winterville is the antithesis of Christmas theme parks. Victoria Park has been made into a magical town with a family-friendly environment inviting all like-minded visitors. .
Winterville is turning on the magic this winter with a sparkling ice rink to capture those magical memories. "Winterville is the antithesis of Christmas theme parks"
New to Winterville this is the dazzling circus, opening to all ages. A fantastic troupe of prestigious acrobatic performers including beautiful, gravity defying ariel artistes, wire walkers, balancing wonders, hilarious award winning clowns and even a guy who fires multiple crossbows to take out an apple off his own head, now that's a show worth watching! Winterville has so much to offer that the list could go on forever! Here are just a few things on what to expect. High quality food that will get you going back for more, a snow white pantomime packed with live music and comedy, pop up shops, the ultimate of Christmas markets, a fantastic fun filled fairground and crazy golf to put your skills to the test! To top it off Backyard Cinema has teamed up with Winterville to create the most amazing indoor, winter cinema. Set in the heart of the festival the Backyard team have created their very own enchanted forest named 'The Winter Night Garden', which can only be accessed via a secret tunnel of trees, this allows you to get all cosy. Whilst watching everyone's favorite Christmas movies you can feast on the high quality food and drink, in the comfort of the enchanted woodland bar. So get yourself down to Winterville for the ultimate Christmas treat!